Kingsley-by-Frodsham, Cheshire, England. Publisher: John Thomas, proprietor and publisher. Editor: John Thomas. This was the journal of the H.B. of L. for one month, until financial disagreements between the order and Thomas terminated the relationship. The H.B. of L. went on to start the Occult Magazine in Glasgow. 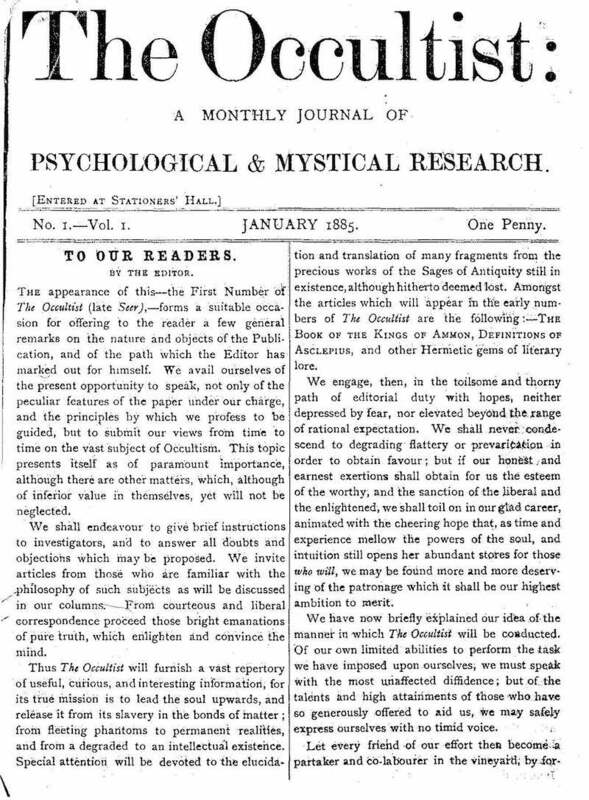 The journal was filled with promises of occult wisdom and reprints of the "Sages of Antiquity" and featured articles by "Zanoni" and "Mejnour" (Thomas Henry Burgoyne and Peter Davidson), and has advertisements by Thomas (for magnetic healing at a distance) and by Davidson for his magic mirrors. See The Seer and the Occult Magazine (Glasgow).